Tag line: "The Fate Of The World Rests On The Courage Of One Warrior"
Master animator Hayao Miyazaki has once again created a marvel. I would describe Princess Mononoke as mesmerizing, beautiful, and even inspiring, but I fear those adjectives wouldn’t do it justice. 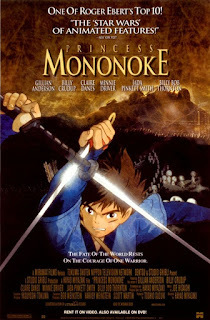 Set several centuries in the past, Princess Mononoke opens with Prince Ashitaka defending his village, which is being attacked by a forest God, a powerful boar that has been transformed into a demon (the result of a piece of iron lodged in its body). The Prince is victorious, but during the fight he inadvertently touches the boar, and in so doing is inflicted with an illness that will eventually kill him. Ashitaka’s only hope is to leave his village and seek out a mighty forest spirit, which has the power to cure him. Along the way, he witnesses a battle between the wolf Goddess Moro and the mortal Lady Eboshi. As it turns out, Lady Eboshi runs an iron works that produces weapons to kill the Gods (it was an iron ball from her factory that changed the boar into a demon). One of Moro's followers is a human girl she adopted named San (Claire Danes), also known as the Princess Mononoke. Ashitaka spends time with both the Forest Gods and the humans in the iron forge, and decides to make it his mission to bring the two together so they can live in harmony. But Lady Eboshi has something much different in mind. As with Spirited Away, Miyazaki's skills shine through in Princess Mononoke. The animation is spectacular, bringing life to this story of Gods and mortals, and the various action sequences, culminating in the battle between Eboshi’s forces and the Forest Spirits, are beyond amazing. Yet, in true Miyazaki fashion, the very surroundings are equally as remarkable. Every being that inhabits the world of Princess Mononoke, man and creature alike, is multi-dimensional, but then so is the forest all around them, which is as much a living, breathing entity as any character. There is magic in Miyazaki's world, a magic so enchanting that you’re sad to see this extraordinary motion picture come to an end. An environmental morality tale that’s also a stunning work of art, Princess Mononoke is a great movie, one you will surely revisit over and over again. And the English dubs are actually fantastic from what I remember. Billy Bob, etc. It's a rare feat. I agree, the English dubs are quite good. I saw the dubbed version when it first came out at the Telluride Film Festival & had the opportunity to see the original Japanese version in Houston recently. The rare occurrence that I prefer the dubbed version.